That was me. Speaking to Jacqui yesterday! I'd just met her. At the time we were house-hunting and she, as an estate agent, had arrived to show us around the house-for-sale. She had introduced herself less than a minute earlier. She had even given me her business card - which I'd unconsciously stuffed in my pocket. Yet, within seconds I had forgotten her name. Yes, I was preoccupied - I was keen to look around the house and was already assessing it from the outside (it wasn't suitable, in the end - the search went on for another month). "I was preoccupied" is my explanation. But it's not an excuse. Because there really is no excuse for forgetting someone’s name. For most people their name is the most important sound in their language - and it can even be part of their very identity. And I felt bad in having to ask her once again for her name – because I knew I had been disrespectful. 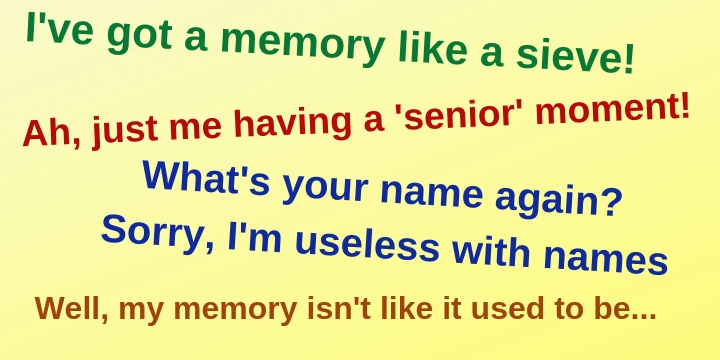 Even though, for most of us, remembering names has little to do with the quality of our memory or our age - or even the number of remaining brain cells! From an NLP standpoint it is, like so many other things we do, just a skill-to-develop and maintain. In this case it is an important life-skill and relationship-skill (that's why we explore it in the first hours of our NLP Core Skills course). And it is not even a complicated skill - there are two stages! This is another common justification for carelessness and thoughtlessness - the "well, it's how I am" excuse! Yep, another cop-out. We are giving ourselves an alibi for not taking that extra second or three to imprint their name in our memory. Clear your mind as you pay attention - nothing to think about - no self talk - for just 3-5 seconds. Look & listen Look at their face and listen to their name as they say it. No self talk! After your conversation - or as they're talking with someone else in the group - picture their face (or glance at them) and again silently repeat their name . These tips will work if you make it a habit to use them. It’s simply a skill so you’ll get better with practise. And, if you do forget a name, backtrack to figure out what you did or didn’t do to cause that – take the lesson on board - and then move on!